The Federal Reserve raised interest rates four times in 2018, taking the Federal Funds Rate from 1.5% in 2017 to 2.5% by year-end. Rising interest rates put downward pressure on bond prices for most of the year. The Barclays Aggregate Bond Index was down between 1 and 3% for much of 2018, causing many investors to question the case for owning fixed income in this environment. High quality bonds proved their worth in the fourth quarter by returning 1.6% while major stock market indexes were down double digits. By year-end, U.S. bonds finished flat at 0.01% and global bonds earned 3.17%. Heading into 2019, much attention will continue to be focused on the Federal Reserve. Will the central bank adapt to current market conditions or will they continue to tighten financial conditions? We cannot predict which direction they will go, but we are confident our bonds are well positioned to be an anchor for our portfolios in either situation. A sea of volatility whipsawed investors throughout the year as all major stock market indexes finished negative. The U.S. stock market was down the least out of the major regions, returning -5.2%. Despite record earnings, U.S. stocks struggled to gain momentum at any point. The S&P 500 finished the year negative for the first time in nine years. 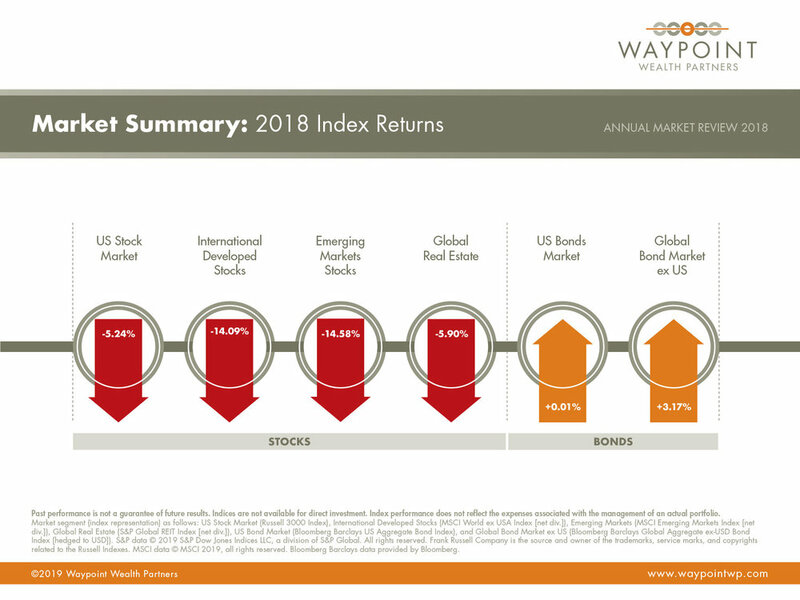 International markets struggled all year long as developed markets returned -14.1% and emerging market stocks posted -14.6%. Trade wars and slowing global growth hurt international economies more as they are far more dependent on trade and exports. In addition, Brexit uncertainty continues to cloud the investment picture as the populist movement continues in Europe. Despite the rough year in stocks, by in large, company fundamentals remain solid. 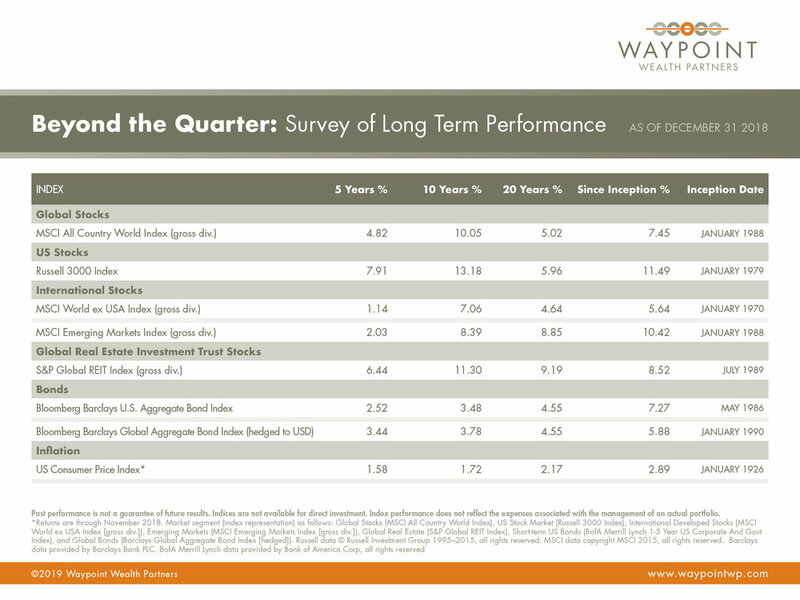 Global valuations have improved and now offer better prospective long-term returns than a year ago. The U.S. economy extended its expansion to 114 months, making it the second longest in history. By many measures, the economy is on firm footing. Unemployment rate remained well below the historical average, wage growth trended in the right direction, and inflation was low. The economic indicators we follow do not show a recession is imminent in the short-term, but we do recognize a slowdown in growth is plausible. Global growth on the other hand has already slowed but remains in positive territory. With this much uncertainty surrounding trade policies, companies are inclined to see how things play out before making investments into their businesses. The good news is we are starting to see signs of progress with constructive dialogue beginning to occur between China and U.S. The ramifications of a full-blown trade war are immense. We hope to see this issue resolved in 2019 so the markets can stop trading on headlines and begin focusing on fundamentals again. Recent trading activity by market participants in shares of a US-based health care provider offers a clear example of how quickly prices adjust to new information. It was reported in late July 2018 that a large private equity firm was in talks to purchase the health care firm at a price valuing the company at $65 per share. Prior to the announcement, shares of the firm were trading around $48. When the announcement broke, the market price for the stock adjusted overnight to just below $65. In other words, after news of the impending sale hit the market, the supply and demand for the stock met at a new equilibrium price. Investing involves risk and the possible loss of principal, and there is no guarantee strategies will be successful. Diversification and rebalancing do not eliminate the risk of market loss. The US health care provider example noted is provided for illustrative purposes only, intended only to demonstrate prices incorporating information quickly, and is not to be considered a recommendation to buy or sell any security. It is also not intended to represent a security purchased, sold, or recommended for advisory clients, and it should not be assumed that the investment in the security identified was or will be profitable. All expressions of opinion are subject to change. This article is distributed for informational purposes, and it is not to be construed as an offer, solicitation, recommendation, or endorsement of any particular security, products, or services. Investors should talk to their financial advisor prior to making any investment decision. Older PostTime heals all wounds?